Around 550,000 machines worldwide are thought to have fallen victim to the ‘Flashback’ trojan, an unusual scare for Mac users. 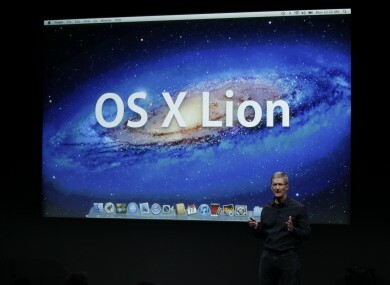 Apple CEO Tim Cook unveils the latest version of Mac OS X, 'Lion', last October. The OS has been exploited by a little-known vulnerability. USERS OF THE OS X operating system for Apple Mac computers have been advised to download the latest software updates for their machines in order to safeguard themselves from a newly-discovered virus. The ‘Flashback’ trojan, identified by a Russian anti-virus software manufacturer, is thought to have infected around 550,000 machines running the operating system around the world. The security scare is unusual for Mac users, who are rarely targeted by malicious viruses as their authors ordinarily target the more popular Microsoft Windows. An analysis carried out by the anti-virus company, Dr Web, suggested that Irish Mac users accounted for 0.1 per cent of the estimated number of victims. The trojan virus – a type of software which claims one purpose but in reality carries out another, more malicious one – is thought to have originated on a number of Russian streaming and gaming websites, and been distributed from there. “According to some sources, links to more than four million compromised web-pages could be found on a Google SERP [search engine results page] at the end of March,” Dr Web said in a release. The compromised pages automatically redirect users to another page which includes a Java applet, which in turn triggers the security exploit. Apple has since released an update to the Java for OS X program which aims to close the vulnerabilities exploited by the trojan. The update can be downloaded automatically from the Software Update area within OS X. Virus specialist website F-Secure has instructions for Mac users on how to diagnose whether their machines have been exploited, and how to remove the virus if a machine has been hit. Email “Mac users urged to download software update after virus scare”. Feedback on “Mac users urged to download software update after virus scare”.